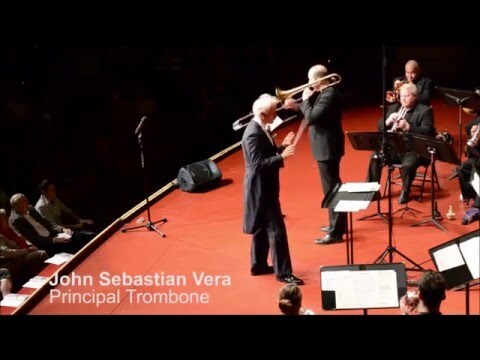 John Sebastian Vera, a native of Texas, became the Principal Trombonist of the Pittsburgh Opera in 2010 and also joined the River City Brass as Principal Trombonist in 2015. A dedicated chamber musician, he also was a founding member of the critically acclaimed Guidonian Hand Trombone Quartet in which he played from 2008-2014. In addition to the Pittsburgh Opera, Mr. Vera has played with the symphonies of Dallas, Detroit, Pittsburgh, the St. Paul Chamber Orchestra, Buffalo, Kennedy Center Opera House, New York City Opera, Vermont, Charleston, Albany, Akron, Huntsville, American Ballet Theatre, and Orquesta Sinaloa de las Artes in Mexico, amongst others. He began his studies with Jon Bohls in Texas and continued his education at Southern Methodist University where he studied with John Kitzman of the Dallas Symphony. He then spent a year studying with Ed Zadrozny as a graduate assistant at the University of Akron and finished his graduate work in New York City at the Mannes College of Music studying with David Finlayson and James Markey of the New York Philharmonic. In 2009, John was honored to be asked to play alongside the New York Philharmonic trombone section as well as members of the Metropolitan Opera to record two pieces for James Markey’s solo release, On Base. With the quartet, John performed over 100 concerts and gave master classes all over the country. Heralded by the New York Times for their “expertly played performances,” they have been recipients of numerous national grants which have enabled them to commission countless composers to create new and innovative works for four trombones. 2014 was the premiere of River of Fundament, a movie by film artist Matthew Barney, in which John recorded for and acted in along with the quartet. Mr. Vera can also be heard on euphonium on the PBS documentary Abraham and Mary Lincoln, A House Divided. John is an Artist for Edwards Instruments and resides in New York City and Pittsburgh. He is on the faculty at Youngstown State University and Slippery Rock University. His favorite musicians include Sigur Ros, Radiohead, the Books, and Efterklang. When he can get away from the trombone he most enjoys basketball, traveling, and psychology.